Before I thru-hiked the AT, I scoured the internet and barraged my thru-hiker friends with questions such as these. Since completing my thru-hike, I’ve been asked these same questions by a number of prospective long-distance hikers. 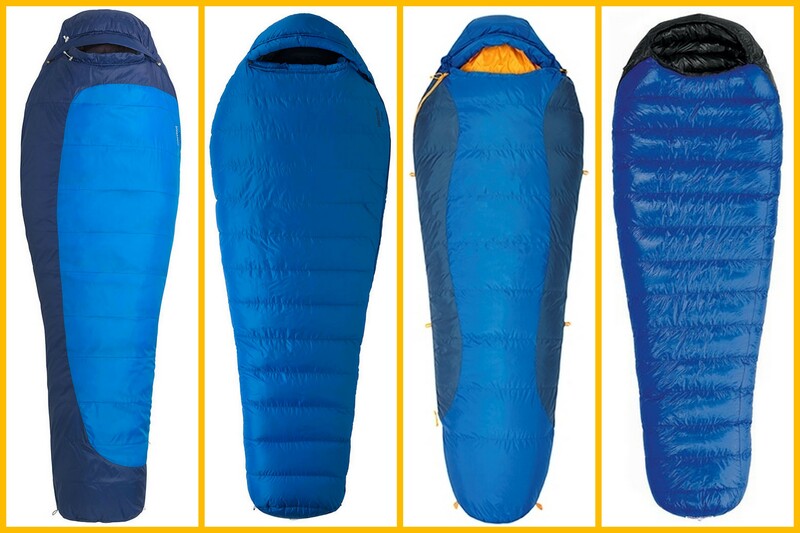 So many factors go into selecting a sleeping bag, and there are so many options to choose from. To answer these and other sleeping bag/pad questions, Appalachian Trials creator Zach Davis surveyed 54 long-distance AT hikers, 47 of whom were thru-hikers.1 I had the great pleasure of analyzing the data, and here’s what I found. (Feel free to skip to the TL;DR at the bottom). There are two basic types of sleeping bag insulation – down (typically from ducks) and synthetic (aka fake down). Naturally, there are pros and cons to each. Down bags tend to take a long time to dry out and to cost more, but they are usually warmer and usually weigh less. Synthetic bags tend to weigh more and retain less warmth, but they usually dry more quickly and cost less. Based on our survey responses and my own experiences on the AT, I would recommend that a 20-degree bag is most likely sufficient for most conditions on the AT. Still, keep in mind that, for the same level of comfort, women usually require bags of a warmer rating than men do. Beyond insulation type and temperature rating, we also asked hikers what brand of sleeping bag they used in the colder months or from start to finish. 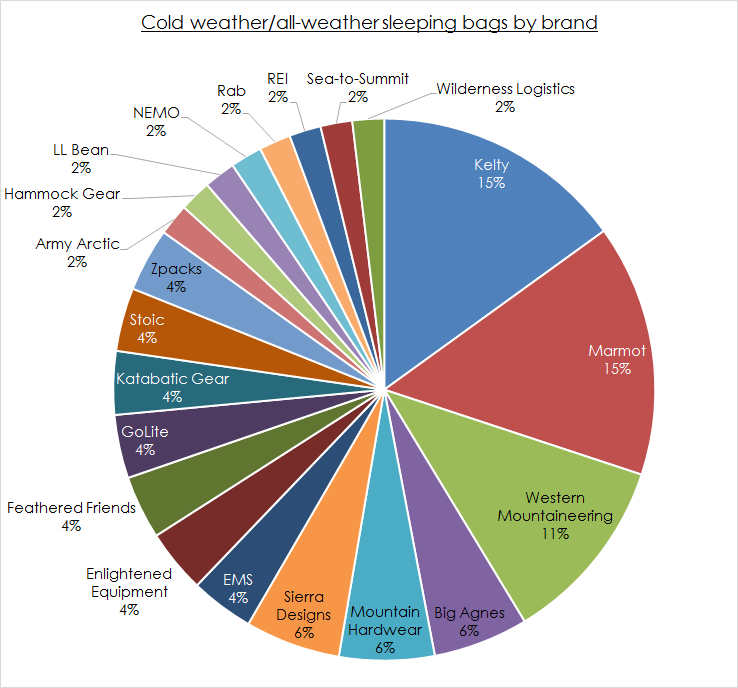 Twenty-one sleeping bag brands were represented, but the most popular brands of sleeping bags were Kelty, Marmot, and Western Mountaineering. Most Kelty bags were from the Cosmic series. Common Marmot bags included the state-of-the-art Helium and more economical Trestles models. The most popular Western Mountaineering model was the UltraLight. Although most hikers (87%) said they were happy with their original sleeping bag choice, around half (45%) of the hikers switched their sleeping bag out for the warmer months. It was not clear from our survey why some hikers chose to switch while others didn’t,5 but most of the hikers who switched were happy with their warm-weather choice (82%). Ten percent of hikers who switched – 1 in 20 hikers overall – just used a liner without a bag during the summer. The hikers who switched to a warm-weather sleeping bag chose from a variety of brands. As with the cold-weather bags, Western Mountaineering was again a popular brand. However, no particular model was especially common among warm-weather sleeping bags. 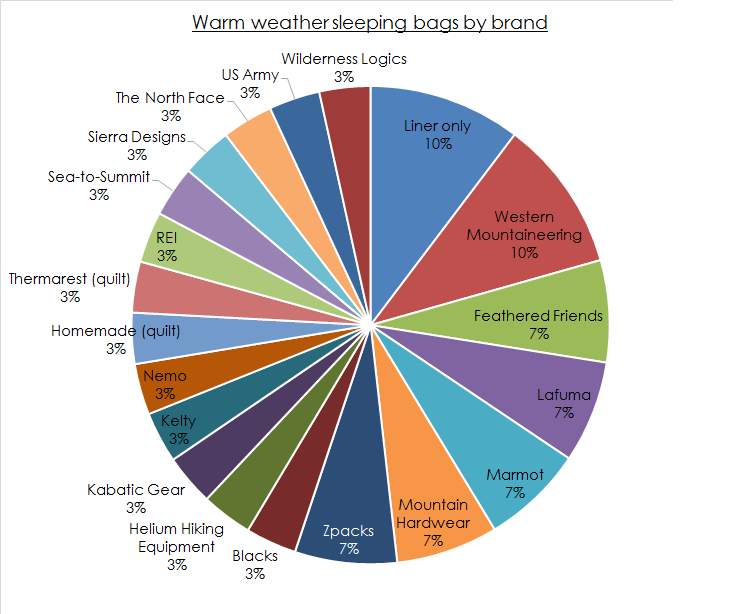 Kelty and Marmot, though popular cold-weather or all-weather brands, were not common among the summer bags. Most of the hikers who used these bags said they were happy with their choice, so most likely, they were satisfied enough that they didn’t feel the need to switch. Although sleeping bags tend to get more hype as one of The Big Three backpacking gear items, sleeping pads are likewise extremely important for both warmth and comfort. The two basic sleeping pad types – inflatable and foam – each have pros and cons. Inflatable pads take up less weight and space, but foam pads are less time-consuming to set up and won’t run the risk of puncturing on sharp surfaces. Of the hikers in our survey, the vast majority (83%) opted for foam sleeping pads. While AT long distance hikers used a variety of sleeping bag brands, they showed a clear preference when it came to sleeping pads. 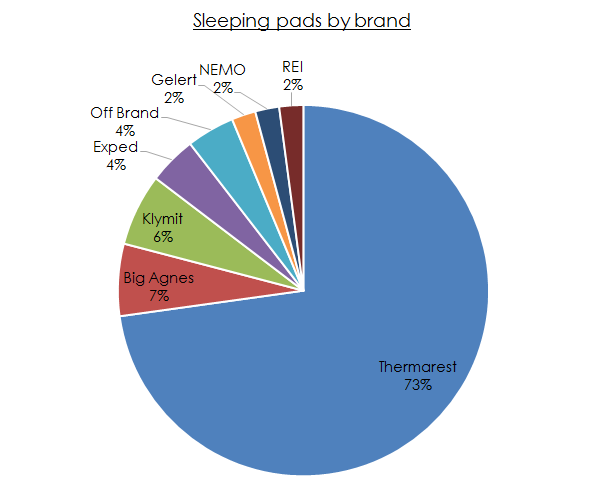 Across both foam and inflatable sleeping pads, the most popular brand by far was Thermarest. Hikers chose a variety of sleeping pad models (and many in our survey didn’t remember which model they used), but the most common Thermarest foam pad was the Z-Lite. A common inflatable Thermarest pad was the NeoAir X-Lite. Down bags dominate: Most AT long-distance hikers opt for down sleeping bags, rather than synthetic, and those who chose synthetic bags tend to be unhappy with their choice. Aim low: 20 degrees F is the standard temperature rating for AT long-distance hikers’ sleeping bags, but the warmer the bag, the happier the hiker. To switch or not to switch? While most AT long-distance hikers were happy with their original choice of sleeping bag, almost half switched to a different bag in the summer, for reasons that remain unclear. Brands of choice are all over the place for sleeping bags, although Western Mountaineering, Kelty, and Marmot are popular options, and warm weather preferences include only using liners. Typical hiker trash – cheap and easy. Most AT long-distance hikers use foam sleeping pads rather than inflatable ones. Long live Thermarest! Three-quarters of AT long-distance hikers use Thermarest sleeping pads. Many thanks to the hikers who participated in the survey and to Zach Davis for putting the survey together. Appalachian Trials previously conducted a survey on footwear. Check out the cool stuff we found here. Because most of the hikers in our survey were thru-hikers, we were unable to conduct many analyses comparing section hikers vs. thru-hikers. X2 = 4.851, df = 1, p = .028 (α = .05). For the synthetic-unhappy group, standardized residual z = -1.9. Standard deviation = 9.01. Median and mode were also 20⁰ F (or -6.7⁰C). Pearson’s r = -.289, p = .018 (one-tailed). Power analysis revealed that, to detect a moderate effect, a sample size of N = 68 was necessary (our sample size was N = 54). Still, I conducted a logistic regression with switching bags for the warm weather as the independent variable. The dependent variables were (1) distance hiked (section or thru-hike), (2) cold weather sleeping bag temperature rating, (3) cold weather sleeping bag type (down or insulation), and (4) happiness with cold weather sleeping bag. None of these four variables significantly predicted (at α = .05) switching bags for the warm weather. Excellent post. Thanks for surveying the people and putting this together. I take exception with your characterization of synthetic insulation as “fake down”. While the original patent for Primaloft® mentioned the words “synthetic down” because it, unlike all other synthetic insulations most closely approximated the thermal efficiency (R value for comparative weight) of waterfowl down (just down, not real down, as there is no fake down); no other manufacturer of synthetic insulations (marketed for more than 6 decades) have ever characterized their product as the same as waterfowl down as that is patently impossible. Synthetic insulation has benefits that a user does not get with down. And of course there are downsides to synthetic insulation such as increased stuffed size, and increased weight for a similar loft; but wet waterfowl down can kill a user by robbing heat in an effort to dry itself, a characteristic that most synthetics do not share. Seven inches of down, seven inches of Qualafil, seven inches of Primaloft, or for that matter seven inches of sawdust, will all keep you safely warm at 0°F. The tradeoffs then are not warmth at all, but compaction rate and weight. The choice a hiker makes then, whether to spend $600 for a Feathered Friends sleeping bag or $100 to buy an REI synthetic sleeping bag involves many choices, none of which is whether or not to buy something fake.